Here is Dave Weinberger musing on networked leadership, and decision making, and how networks allow us to manage complexity working with its potential. The decision-making process that we have now is a very direct response to the problem that the people who make the decisions can’t possibly know enough to make competent decisions. That’s in fact how the structure of corporations was created right from the very beginning, from the invention of the corporation. It was designed explicitly as a way of filtering information up to the top, and filtering it at each step it gets reduced, and so you have somebody who is at the top of a corporation that’s way larger than what anybody ever dreamed of in the 1860s, when corporations were invented to manage nationwide railroads, now they’re managing corporations like GE, where the CEO is making decisions about the toaster division, the nuclear reactor division, the television news division, the pharmaceuticals, the investing division, an insane set of businesses, each with its own deep complexity, and one person at the top is supposed to be making decisions about all of them. There’s nobody who can possibly know enough to make those decisions. You just can’t. And so when we see things really scale up on the net, as we do with Wikipedia or some of the large collaborative projects like Linux and Debian and the like, the decision making changes, and rather than thinking, oh, we’ll find one person who’s smart enough to make decisions, no, we have a network, let’s do this in a networked way. 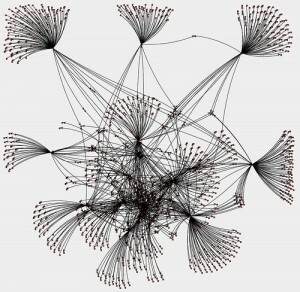 And what are networks good at? Well, if a decision can be kept local, the person who knows most about the thing is the person who is dealing with it every day, the local decision. And when it’s too hard or has too many effects, then let’s spread this out throughout the network through discussion and through argument, and let’s come up with new ways, which are in fact being invented, that allow in some cases a vote, or in some cases require consensus. Or in the case of the IETF, which is responsible for much of the technology of the internet, they hum. At an IETF meeting, to signify assent, everybody hums. Why do they hum? Probably because it’s a little quirky, we’ll start with that, but also because you can’t tell who’s humming and who isn’t, so people are more free to express their genuine feelings without feeling the social pressure to go one way or another. And also, it makes a really nice noise that expresses the consensus. Now I’m not saying this is the only way networks can make decisions, but when you have a new environment, a new network, a new infrastructure that can scale in a way the old can’t, you do want to see innovative new ways of making decisions that take advantage of it.